I kind of feel the need to start this post with an apology. 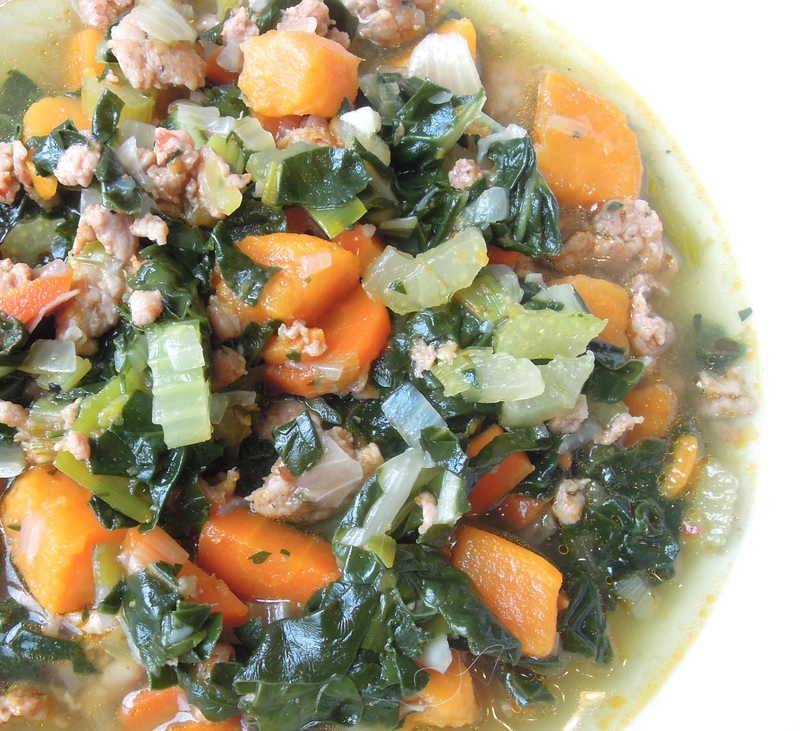 We’ve been eating this soup all winter long and I’m just getting around to sharing it with you now. So guys, I’m sorry. After making yet another pot of it this weekend, I’m finally here to tell you about it. It’s simple, extremely flavorful (especially for a broth-based soup that’s not even made with homemade broth), and totally healthy. You start by browning a pound of spicy Italian chicken sausage (or any kind you like). Scoop that out and add some fresh onions, garlic, and leek to the pot to really boost the flavor. Dump in your carrots and celery. Add the sausage back to the pot along with sweet potato chunks, chicken broth, and a little water. Once you’ve reached a boil add your greens and parsley. I typically use swiss chard, but you can use anything that strikes your fancy–spinach, kale, and collard greens all work great, too. Keep things at a simmer for about 20 minutes and dig in! I can confirm that this soup heals all. As much as I like to keep things happy around here I also like to stay honest. So I’ll admit I’ve been fighting a case of the winter blahs this year (it’s hard not to with the constant grey skies, snow, and cold). At the same time, I could feel a cold creeping in late last week that had me down for the count throughout this weekend. A few spoonfuls of this soup helped me keep in mind that despite my sniffles and sighs, you can always take a moment to savor the good stuff and remember that neither will last forever. Though I sure wish this soup would! Heat 1 Tbsp olive oil in a pot over medium-high heat. Add sausage and cook, stirring occasionally, until browned. (Once it’s cooked, I like to take a wooden spoon and break it up into really little pieces.) Transfer sausage from pot to a bowl and set aside. Add additional olive oil, about 1 Tbsp, to pot if needed. Add onion, garlic, and leek. Season with some salt and pepper. Saute until softened, about 5 minutes. Add celery and carrot to pot. Saute until they start to soften, 5 to 8 minutes. Return sausage to the pot. Add the sweet potato, chicken broth, and water. Raise heat and bring to a boil. Add swiss chard and parsley to pot. Lower heat and simmer, uncovered, until vegetables are very tender about 20 minutes. 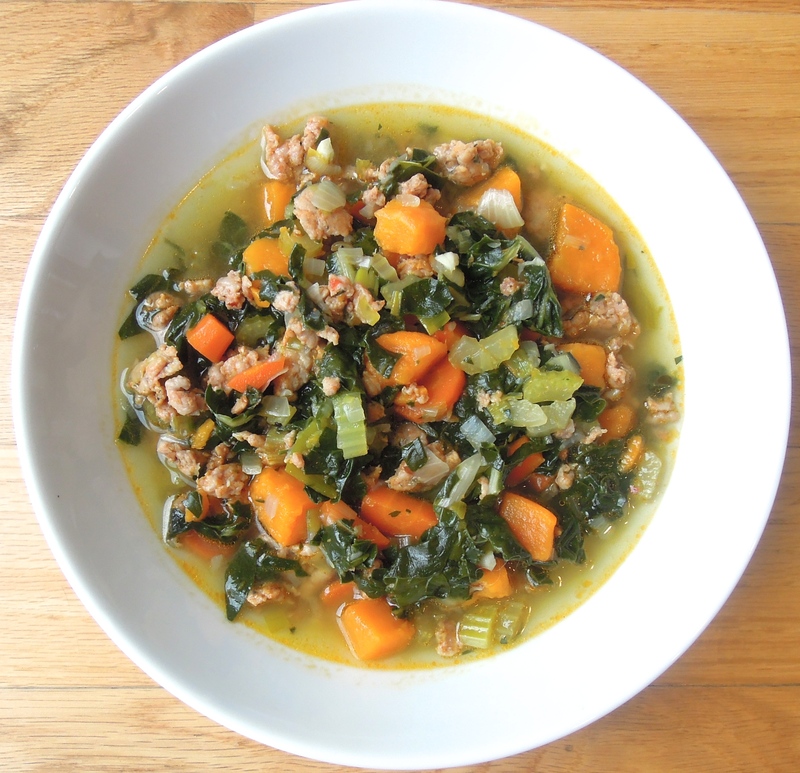 This entry was posted in Soup, Vegetables on February 3, 2014 by Paige Greenfield.